The e-mail that came today brought the news I’d been expecting. 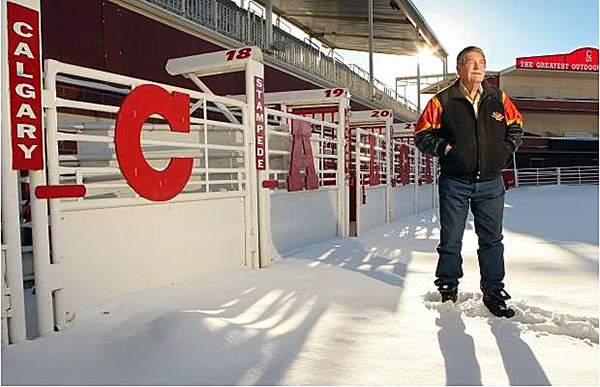 Still, I’m saddened by the death a rodeo legend, author Dwayne Erickson who penned thousands of articles for the Calgary (Alberta) Herald and shared the exploits of Canada’s champions for millions of readers over a storied career. If there was a story that needed to be written a Canadian cowboy or cowgirl, Erickson surely was the person who needed to write it. Erickson died Monday after a battle with cancer. I’d learned about his fight just 11 days ago, when another Canadian colleague, Ted Stovin, called to share the news. Dwayne was a fixture in rodeo, and every Canadian who had ever qualified for the Wrangler National Finals Rodeo knew it was their duty to march to the media room as soon as they finished their ride or run, where they’d sit and answer his questions each night. Whether it was Rod Hay or Glen O’Neill, Curtis Cassidy or Lee Graves, they would make sure to have that one-on-one time with Erickson, who, for years, smoked and drank beer as he worked in the NFR media room. He was one of the last holdouts when the media room became smoke-free. The last time he covered the NFR was in 2010, my first year to ever be in Las Vegas for all 10 nights of ProRodeo’s championship event. Toward the end of the run, Dwayne motioned me over to his area, and I took the seat next to him typically reserved for Canadians. “You ever thought about moving to Calgary?” he asked. Well … not really, I responded. That was a flattering offer from one of the sport’s most significant voices. He was a two-time winner of the PRCA Media Award for Excellence in Print Journalism, in 2003 and 2012. Most importantly, he was a torch-bearer for millions of rodeo fans in Alberta and the rest of North America, and he should be remembered as such.